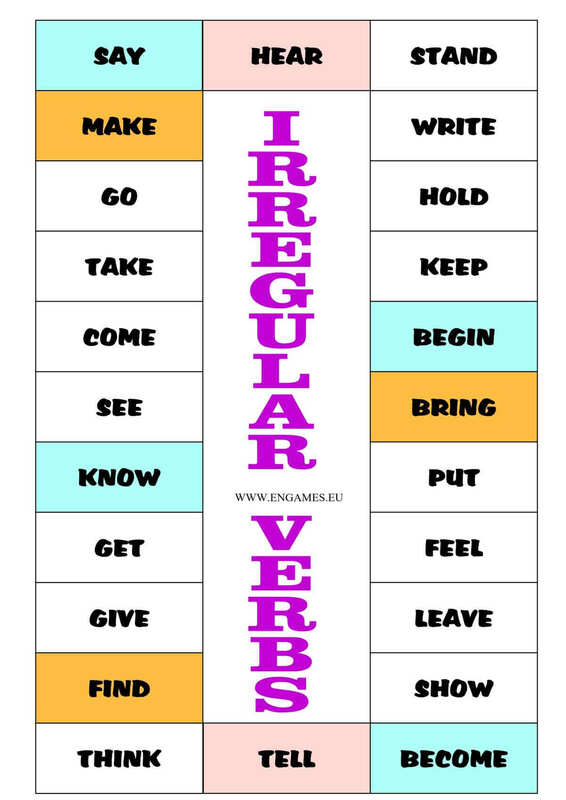 Irregular verbs in English are very important for students to learn. These verbs belong among the most frequent words in English and if you want to speak about your experience you cannot do without them. Therefore it is extremely important to give a lot of time to teaching and learning these verbs. All of the activities above will make teaching and learning the irregular verbs easier. I have already published many activities but this time I come with something new.A board game. The game is called Catch me! (if you can). The rules are simple and the preparation time is low. The game is fun and students have to produce all the irregular verbs. To play this game, you need to print the game and the key for each group of students. And you can print the game from the pdf file. This game is for up to five players. To play the game, each student needs a counter. Each group needs the game and a key. Each player places their counter on one of the coloured squares. If there are just two players they place their counters on the pink squares. If there are three players they place their counters on the blue squares and when there are 4 players, they place their counters on the blue squares. If there are five players, one of the players is a referee. Students decide who will start. The last player takes the key and serves as a referee for the first move. The player one moves counterclockwise and he/she has to say the past tense and the past participle of the verb in the square in front of him. If he or she does this correctly (the referee decides), he/she moves to this square. The player goes on like this till he/she makes a mistake. Once they make a mistake, the referee tells the player the correct answers and the player stops on the square in front of the square with the verb he/she did not know. Player one now takes the key and player two tries to move on in the same way. Players take turns after they make a mistake. The aim of the game is to catch the others. Once a player gets to a square someone is standing on, they catch the player and take them out of the game. You can change the aim and say that the winner is the student who returns to the square where they started first. You can find more interesting activities at British Council site. And of course there is the wonderful song by my friend Jason.